Bergen-based Francisco Munoz creates photographs with a striking use of color. The deep saturation of his images draw you in, emphasizing both the moment and the subject. 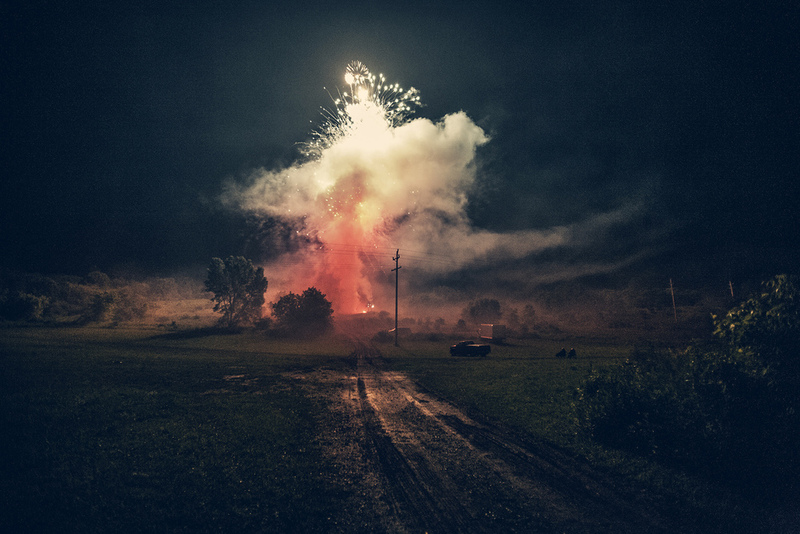 This particular photograph was taken during the July 4 celebrations in upstate New York. Francisco explains that there were many veterans present, and feeling quite caught up in the moment he captured this snapshot. "I felt their pain in a way", he explains. It is a powerful photograph, capturing a moment that at first seems violent and dangerous, but then reveals itself to be a celebration. You wonder about the couple sitting in solitude, watching from a distance. Francisco mentions painter Nikolai Astrup as an early artistic influence, being drawn to the strong colors and abstract way Astrup used light in his art. Looking at the painter's depiction of bonfires in the landscapes of Western Norway, Francisco's photograph beautifully references Astrup's work.